#Boyhood – First Time Ever! Every impossible phenomenon is only impossible, till someone who has the conviction to bend the limits and change the rules. Boyhood! One can go on and on about this film and yet not touch the slightest glimpse of what it has achieved in itself. Shot over the period of 12 years, Boyhood is a cinematic experiment that has yielded unbelievable results. The movie being made, itself is a legend and worthy of a nomination. But for everyone remotely interested in enjoying the film, keep aside this fact when you go to the theatres and just let it flow through you. 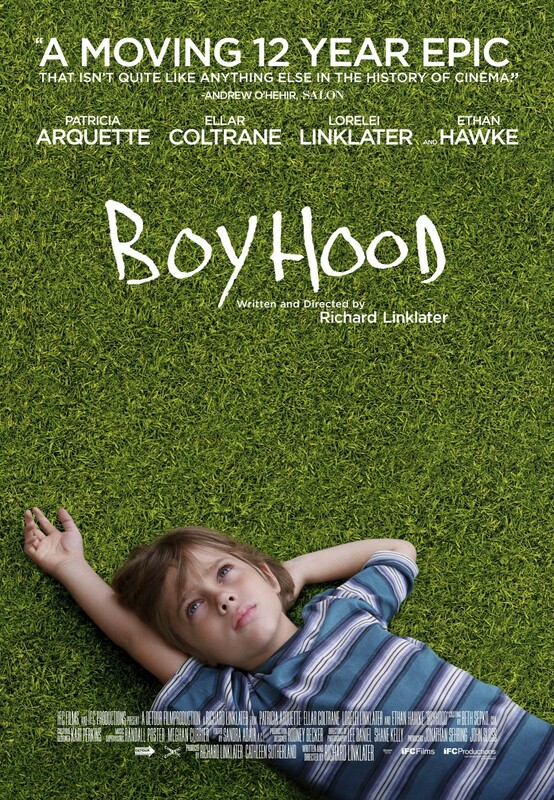 Boyhood is a bundle of moments that encompass 12 years of the life of Mason (Ellar Coltrane) from the age of 5 to 18. The theme of the film is growing up. We are introduced to three most important characters in Mason’s life – His mother ( Patricia Arquette), his sister (Lorelei Linklater) and his father (Ethan Hawke) and a lot of important yet temporary characters. Speaking of the plot of the film, I wonder if there is any plot to the film. The film starts abruptly and it ends abruptly. We simply wish to see more of Mason after the film is over. To me, the protagonist of the film is time and Mason is the point of view character. Time goes by and we are mere observers. There are hard times and there are times when we are completely lost. But no time lasts forever. It is constantly changing. And at the end of the day, we are just in the perfect place to say, that we did alright. The music in the film, needs an honourable mention at least. I am hoping to find the entire OST of the film as a playlist somewhere. The change in the mood of the track can let us track the change in the mood of the characters. We learn a lot, not only about Mason, but also about his father through the songs that he writes for his kids. And apart from that, songs provide the necessary transition between different vignettes in the film. Something the Contemporary Indian Cinema very generously lends its distant cousins. Speaking more about change and consistency, some of the characters change. Some of them stay the same. Or to put this in better words, the goals of all these characters evolve from time to time. Mason’s Father graduates from being a manchild to a well settled man. As he puts forward himself in the film, he becomes everything Mason’s mother wanted him to become 20 years ago. On the other hand, Mason’s sister remains the same throughout. We are talking about the basics. How one person deals with a problem and what is that person’s first reaction to it. When I watched School of Rock, I didn’t even know about Richard Linklater or the Before Series. When I first watched Boyhood, my initial reaction was burdened by the so called “gimmick” of the film 12 years in the making. Mainly because, if I have to make the film right now, I would make it in a different manner. I stay in a different part of the globe and the culture is vastly different over here. And the film relies on the simple moments shared by everyone while growing up. On watching it for the third time, by some alterations I could easily find my impressions in Mason. I could find my mother’s sacrifices for me and my younger brother and I could see my father’s inability to express his love for us in the film. And I feel that is the biggest achievement of the film. To generalize something as simple and as universal as growing up!